using Hamadi Organics Healing Serum. I’ve added this product to my nightly beauty routine. It’s made with Ylang Ylang,Vanilla, Bergamot, Palmarosa, amongst other organic amazingness. This product is a multitasker, but I use it to revive my split ends, and moisturize all over. 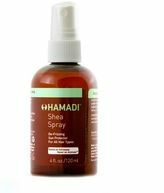 I also like their Shea Spray, it’s a de-frizzing sun protector that will not weigh your hair down.So get organic with Hamadi, and get in bed more often…..